ShanghART Gallery is pleased to present Ivory Black: Ding Yi Solo Exhibition from 22nd January to 15th March 2015. The exhibition will be the widely acclaimed Chinese Contemporary Artist Ding Yi’s first solo in South East Asia, showcasing 11 paintings from his signature series – Appearance of Crosses, 1 installation and a public art sculpture. Ding Yi and National Heritage Board, Group Director for Programmes Mr. Tan Boon Hui will conduct a dialogue session on public art sculpture at Art Stage Singapore 2015 while an exclusive collectors luncheon will be held on 21st January in conjunction with Platform Projects Ltd.
DING Yi is regarded as the forerunner of internationally acclaimed Chinese abstract artists. In his recent works, he explores the existence of unforeseen natural phenomenon, and his works changed from expanding vibrant color to reserved dark color. 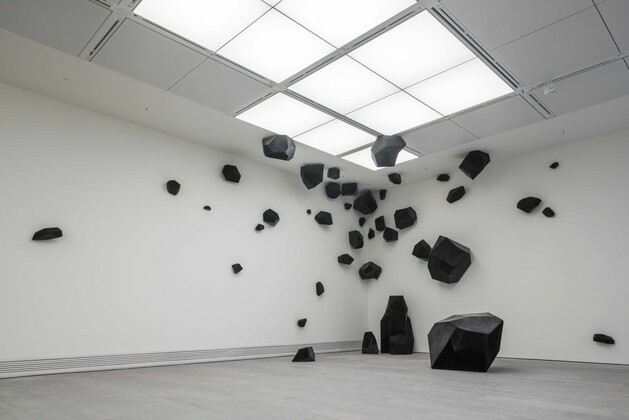 The installation – Flying Stone seems to be a metaphor of infinite matter, demonstrating the precariousness of reality and the mystical galaxy. Known for his systematic compositions and variations of the same motifs ‘+’ and ‘x’, the work is multiplications and the proliferation of these two simple brush-stroked gestures. The overlapping of ‘+’ and ‘x’ creates an interesting surface that is constantly oscillating between the flatness and pictorial depth, a kind of tension between movements in two dimensions that becomes a complex three dimensional system. Ding Yi uses his cross-shaped symbols to interpret the strength of the Chinese spirit in this state of flux. During the past decade, Ding Yi has redefined his painting style in Shanghai, the post-modern metropolitan where he grew up. The consistent formal element of the cross in the work embodies a complex interplay of precision and dynamics. Dynamic changes of the city are vividly captured in his paintings. Nevertheless, it breaks through the framework of traditional narrative and represents life in an abstract way. The overtone of the signs he uses touches upon the correlation between human beings and the universe. To keep a sober and independent mind within collective consciousness implies a kind of Zen-like ambiance which highlights exactly his attitude in art creation.